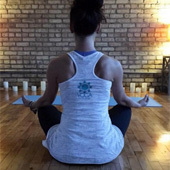 “Six years ago, I went to my first yoga class and realized I really liked this stuff! It took one class for me to become hooked. I was lucky. I had a great teacher for that first class and although there were would be some teachers that I didn’t always vibe with, it didn’t deter me from coming back to my mat. Flash forward to May 2015 when I heard that Yoga for All Beings was going to start a teacher training. The decision to sign up for the teacher training wasn’t an easy one. I wondered if I knew enough about yoga. I wondered about how much of a commitment it would be. I wondered if the fact that I can’t do a handstand would hold me back. All this wondering led me to believe that if I was thinking about it so much maybe it was something that I wanted to do and all of this stuff that I was ‘wondering’ about were reasons to actually go ahead and do it. So I did. I didn’t want to pass up this opportunity to grow and learn more about my practice and begin to acquire the skills to teach others about yoga. I wasn’t sure what to expect, but I knew I was in good hands with Danielle, Melissa and Jenni. I do not regret my choice. I have loved learning about proper alignment, pranayama (breathing! ), the yamas & niyamas, all the variations of yoga that there are, and so much more. Most of all I have loved being part of a community. Danielle along with the other teachers and my fellow teacher trainees in the program have shown up for one another, have listened to and learned from one another. A safe place to learn, grow and ask questions was created. I could not have asked for a better experience. This session of teacher training will be culminating at the end of the month. I have to be honest and say that I’m excited to sleep in on a Sunday morning again, but I am also going to miss having the time set aside to delve deep and ask questions about yoga, or a pose, or something that happened in a class that I found interesting/confusing. 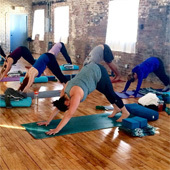 I’m glad I invested in this Teacher Training and in myself because the benefits have truly been countless, but to name a few: a stronger practice on and off the mat, supportive friends, a foundation set of skills to teach yoga, amazing mentors, and a deeper appreciation of the greatness that can happen when you put your mind to it.” – Maria V.
“I just wanted to let you know how much I enjoyed the ‘nuts and bolts’ class today. Also Bethany and Gail are the two favorite trainers I’ve ever had – I’m a total novice and have tried many places – they are my favs. I’m inspired to make more classes after today.” – Colleen D.
“What a GEM! I cant say enough good things about this studio. I have actually put off writing this review because I know I can not possibly find the words to do this place justice. The studio itself is amazing. The yoga room is bright, open, airy and provides a sense of calmness and peacefulness. The instructors at YFAB are all great. It doesn’t matter if you are new to yoga or if you have been doing it for years they are all non judgmental and provide an environment that is conducive to growth, change, and healing. The owner Danielle, is awesome and you can tell she really loves and cares about her studio. Before finding this studio I was an avid gym member who did yoga on the side either at the gym or at a studio. Now I can’t imagine not having a studio like this to go to. There is definitely a sense of community that goes along with being a member. It is a non pretentious environment which is great so you can spend more time on your practice and less time worrying about what you look like. Lastly, parking here is free and a breeze. There is also a cute little vegan shop across the street called Upton’s which is great for a post yoga meal, (food is good even if you aren’t vegan). If you are thinking about giving this place a try I HIGHLY recommend it. Trust me you won’t regret it! I have friends and family who have joined after my urging and they all LOVE it! YFAB you are simply awesome! I am so grateful that you exist! !”– Sofia K.
“I had the pleasure of joining as a student for the first yoga teacher training session at YFAB. I had been looking for the right program, and had only been able to attend a few classes at the studio before training started, but the community and good vibes that I experienced during those few classes convinced me that YFAB was the place to learn about teaching. Now seven months later, that sense of community and positivity extends to just about all the many classes I have taken at YFAB. It envelopes you just as much as the warmth, light and mild smells of incense do, right when you walk in the door. Yoga is a huge quilt of a subject, with countless layers and folds. For our 200-hour training, Danielle Jenni, and Melissa assured us that what we would learn would just be the beginning, the foundation. Still, we certainly got such a rich sampling of so much information about the physical, spiritual and lifestyle aspects of the yoga practice, which both deepened my understanding for personal practice and made me feel ready to inform others about yoga with more context. It was great to have input from more than one teacher and teaching style; D, J and M gave us their earnest, open-minded and practical takes, and also made a point of exposing us to yoga teaching practices, styles and trends beyond their own. And the practical application, and practice teaching parts of training were so helpful that we only wished there were eons more time to practice together. Our six-month training ended a few weeks ago, but I am sure reverberations and revelations will continue for a long time. I look forward to attending more yoga workshops, trainings and seminars at YFAB and beyond. And meanwhile, I continue going to YFAB classes as a loyal community member, because I can count on the broader community of teachers to be talented, warm and knowledgeable. Thanks again Danielle, Jenni, Melissa and the YFAB team! See you soon ;-)” – Leah L.